Shepherds Run Farm – We run with the big dogs – We don't stay on the porch. We run with the big dogs – We don't stay on the porch. Previously I was writing about my goal to blog more this year. At this point, I have already written more blog posts in 2018 than I did in 2017. So, I guess that is a good way to start working on my goal. So what exactly is the next step? For starters, I need to blog more posts than I did in 2017. Since I think that was a whopping two posts, I think I have already surpassed that number upon the publishing of this post. Yay!!! right?? Yeah, nope. That is not enough, we need to find a way to measure and DEFINE success. So my ultimate goal is to have a blog that I can monetize. So does everyone else, right? Well, I am not concerned with everyone else, just ME. The monetization goal is going to be a long term goal and I am going to leave that one alone for right now. I’ve got to start with the foundation before I try to raise the flag at the top of the castle. So…let’s work on how to make it measurable. How am I going to define success as it relates to my goal? Well, that is somewhat easy. I just pick a number, but what number? How many posts do I want to do for the entire year of 2018? Would one per month be reasonable? Or would that be too low? What about one per week, or one per day? Reasonably, I probably would not be able to commit to writing a post each and every day for 2018. For starters, we are already half way into January so I have missed many days. 😦 But all is not lost, as I can start from this day forward and figure out what would be reasonable for me to commit to doing. I think I can reasonably commit to doing one post per week. So given that I have already missed the first three weeks of the year, that would be a total minimum of 49 posts. Okay, I think I am up for the challenge. Speaking of challenge, every couple of months there is another Ultimate Blog Challenge. Maybe by the next one, I will have gotten into a rhythm and will be able to go with the flow long enough to actually complete the challenge of writing one post per day. After I have decided on how to measure success, I need to review whether or not my goal is ultimately achievable, do I have the power to do it, is it realistic, and is it the right time to attempt the goal? The answer is yes, to all three. So, here is my redefined SMART goal for better blogging for the year 2018. I want to blog a minimum of one post per week; a total of 52 posts for the year 2018 so that I can build a better blog presence and eventually have enough followers to monetize my blog. If you want to learn more about SMART goals and how they might be able to help you reach your goals, check out this article from Mindtools. Let me know how you do with reaching your own goals. This falls under the “well, crud” aspect of life. On this somewhat warm January day, I did a quick check on the status of my hives. 3 of the 4 are dead. No explanation, just dead. The hives in happier times. Since it was a quick check, I only popped the top and do not know if they had stores or not. I will know tomorrow after I suit up and get in each of them. Boy, I am not a happy camper at this point. Not to mention that it puts a real crimp on my goal to increase honey sales this year. Now I am faced with the dilemma as to whether or not to purchase bees from a bee supplier. Unfortunately that is an expensive proposition, one with no guarantees either. I have done that before and they didn’t even make it through the first year. 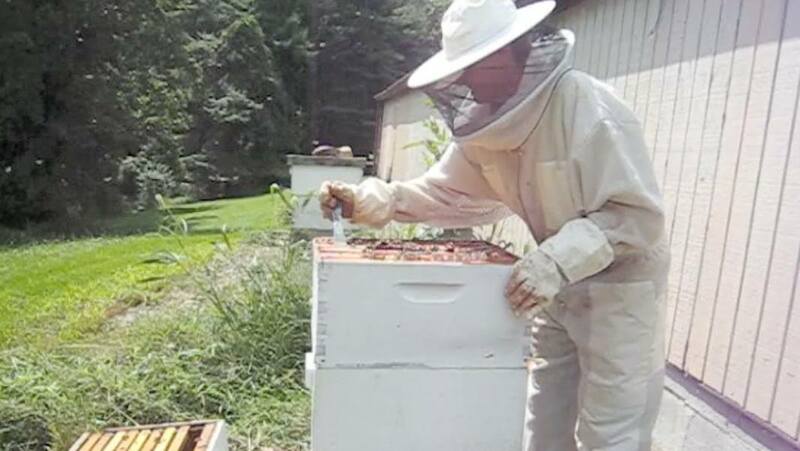 Any loss of bees is hard on a beekeeper, but it is especially hard for small “beeks” like myself. If you keep bees, how are your colonies doing? Will you be ordering packages this year? If so, who is your favorite supplier? Let’s be SMART about this. In my previous post I mentioned some of my goals for this year. Every goal was a thing to “do”; meaning it required action on my part – train dogs, blog, garden, harvest, preserve, etc. There weren’t any what I would call personal goals, i.e. be a better person, love thy neighbor, etc. I did indicate that I wanted to learn some new skills so maybe that could count as a personal goal. What do you think? As I also mentioned in that post, I would be implementing (or attempting to) the SMART goal theory. The acronym was first conceptualized by Peter Drucker in his Management by Objectives approach as a means to motivate employees to get onboard with an organization’s objectives. Over the years, the method has been utilized by counselors, teachers, fundraisers, organizers, you get the picture. So what is the SMART goal concept? Specific, Measurable, Attainable, Realistic, Timely. The letters stay the same, but some of the words change depending upon who is explaining the concept. Such as attainable might be achievable, timely might be time-bound or time-sensitive, etc. The words may change, but the initial concept stays the same! So how can I apply this theory to the goals that I want to accomplish this year? How can I be more specific about my main goal? What specifically WAS my main goal? It was to “blog more” (rather vague but we will get to that later) – find a purpose and stop struggling with it. Think about “who, what, where, when, and how” when formulating your goals. Where – that’s a given, here. When – well, that’s where things get sticky. Every day, week, month, what??? How – this is also a sticking point. Obviously, a plan needs to be formulated. Sit tight because that is what we are going to work on. I am going to work through all five steps of Drucker’s plan to see if I can come up with a SMART goal to increase my blogging consistency. (I really can’t tell you the number of times I have started a blog and stopped. Ugggg!) So click on the arrow to see how it all worked out. Early goals, how long will they last? So what ARE my goals for this year? January is more than half over and I have had many days to think about what my goals are for this new year, 2018. Blog more – find a purpose and stop struggling with it. I need to craft a better “About Me” page. Find a voice – Lawd knows I’ve got one somewhere, just ask my husband. Be consistent – it doesn’t have to be every day, just DO IT! Garden more – waste not, want not, grow good food and be a good steward. Find creative ways to preserve and extend what the garden produces. Make a point to can, dehydrate, freeze all that I can harvest. I “have the skills, I have the technology”, I can do this. Plan meals to utilize fresh foods without having to eat zucchini every night. Improve my beekeeping skills, increase honey profits and continue to keep the interests of bees first. Find a way to make my blog profitable, our homestead profitable, and minimize outflow. Learn new skills: bushcrafting, homesteading, foraging (I really want to learn about foraging for edible mushrooms). resource guarding (all ways that this might manifest). Exercise, exercise, exercise the dogs! Do they sound like good goals to you? In my next post I will talk about some of my plans to achieve them by using a version of the SMART goals formula. Have you been able to define your goals for 2018? If so, what are they? 2018 – Woohoo!! Oh No! Does the new year fill you with hope or dread? For me it is a complex series of emotions. Always has, and I expect it always will. Does your new year start out with a bang only to go flat after a few weeks, or only a few days? After all of these years have you given up on making resolutions? Do you swear to yourself that THIS year is going to be different? Maybe we all do to some extent. For me, the follow through has really dropped off in recent years. It’s actually getting depressing. It is not that I don’t want to but “eh, why bother?” is what usually comes to the forefront. I have goals, dreams, but things seem to take so much effort these days. Yes, I know that can be a sign of depression but I don’t think that is it. I’m happy. I usually have an upbeat mentality, but staying motivated seems to be my biggest struggle. There’s a quote from Jim Rohn that I really love. “If you really want to do something, you’ll find a way. If you don’t, you’ll find an excuse.” – Jim Rohn 1930 – 2009. Excuses are really easy to come by these days. I’ve got to find a way to change that if I want to get anywhere with my goals. Take for instance the January Ultimate Blog Challenge. I was supposed to start blogging on the first of the month and what is today’s date, the 16th. If one peruses through my posts, they will find sporadic entries and a lot of good intentions. Is this year going to be different? Maybe, I’d say it is too soon to tell but it’s not looking great so far. Michelle Shaeffer has a blog post entitled “How to be Productive When You don’t Feel Like it.” In it she lists several ideas for getting back on track. A couple even appeal to me. 🙂 I really like the “piece of cake” idea. The idea of starting small is a tried but true method; chunking and breaking things down into small steps works for some. Setting a deadline and holding oneself accountable for that deadline, and finding one’s flow. All great ideas. But which one will really work for me? I am on a Homesteading Facebook page. One of the mantras is “start small” and do what you can conceivably manage. Biting off more than one can chew can cause feelings of frustration and disappointment to set in. In the case of someone just setting up their homestead, it can even get someone killed. In a recent discussion on that page, someone commented with “plan your work, work your plan.” So that sounds as if my “Step 1” is to come up with a plan for 2018. What is your plan for this new year, and how do you plan to go about achieving your goals and dreams? I am in my 50th year as my Grandmother, Jane Olivia Reaney Linton, would say. But I don’t turn the big 5-0 until the 14th of June. In case you are wondering, I am celebrating. I know many of you are familiar with the metaphorical “weight off of my shoulders” well, I am here to tell you that when one chooses to declutter both mentally and physically, there is a “lightness of being”. It is refreshing, uplifting, encouraging, energizing, empowering, and the list goes on. It is a feeling like no other. This week I once again tackled my closet and my dressers. I am happy to report that I have some wonderful things to give to the homeless shelter associated with a friend’s church. As I put each item in the bag, I was joyful at it’s new life; giving warmth and maybe joy to someone who could use it – instead of just taking up space and cluttering up my life. The excitement / joy I feel is incredible. I really wish I could share it with each and every one of my friends. I truly would want you to know this peace that I feel as a result of simply finding some really great things to share with someone else. Let’s face it, as a beekeeper I struggle every year with what to apply to help keep weeds at bay. This is especially difficult since I do not want to use the commercially available weed killers. Last year I gave up completely and the farm looked like that Husqvarna commercial – “Taming the Wild”. Without those name-brand weed killers, what’s a girl to do? This year I was bound and determined to find a way to deal with the ever-present “Wild” in my garden and around the farm, and so began my internet quest. For the record, I did look at the weed torches available and decided that fire was probably NOT the right way to go for me. 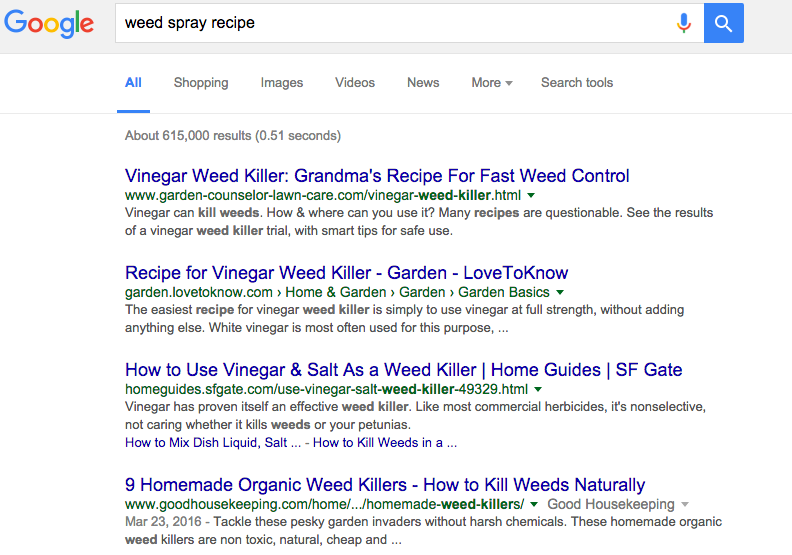 So I continued my search and it didn’t take me long to find several recipes for homemade weed spray. Click HERE, HERE, and HERE for some options. All three offer some different information (although the recipes all contain vinegar) so check them out if you’ve got the time. The guy in the following video gives you a 9-minute tour of him killing weeds. The gallon sprayer in my feature photo contains 1 gallon of white vinegar, about 1/4 cup Dawn Blue dish detergent, and about 1/2 cup of epsom salt. I did my spraying about 1 pm, it was day with about 80 degree temperatures and low humidity. On a side note, Lowes Home Improvement apparently sells 64 oz. containers of cleaning vinegar for $1.79 (according to their website – it’s in the cleaning section) I paid $2.48 p/gal. at Walmart (better deal) for 5% acidity white vinegar. Click HERE for the difference between regular vinegar and cleaning vinegar. Before spraying with vinegar solution. A little less than 24 hours later. 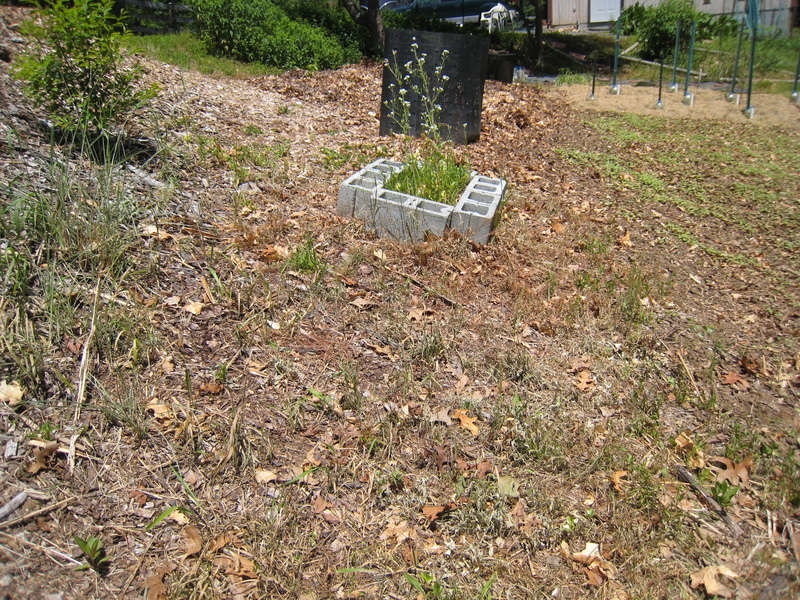 The solution worked very well on “grasses” and light-weight weeds. I sprayed the solution on some chocolate mint and it barely turned the edges of the leaves brown. I may have to spend a bit more time on plants like the mint – making sure I really cover them. Maybe adding some of the essential oils mentioned in the recipe links above might be the answer. I am not sure at this point. I will report back when I have a better idea what will work on the mint. After 24 hours, works on some weeds, but not all. The mint is in the top left edge of this garden, you would hardly know it received any solution. 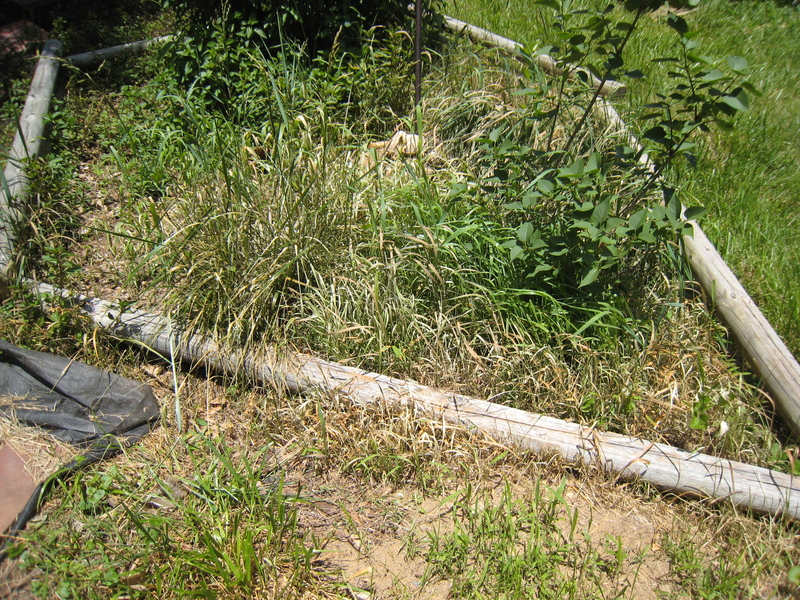 Maybe it will take a little longer for it to work on the mint but as you can see, the grass has started to die but there is still a lot of green around my butterfly and lilac bushes where the mint has invaded the space. Verdict: this homemade spray might be an acceptable garden weed killer to use in place of anything commercially available. I don’t mind spraying every week if I can avoid having to use the toxic chemicals. 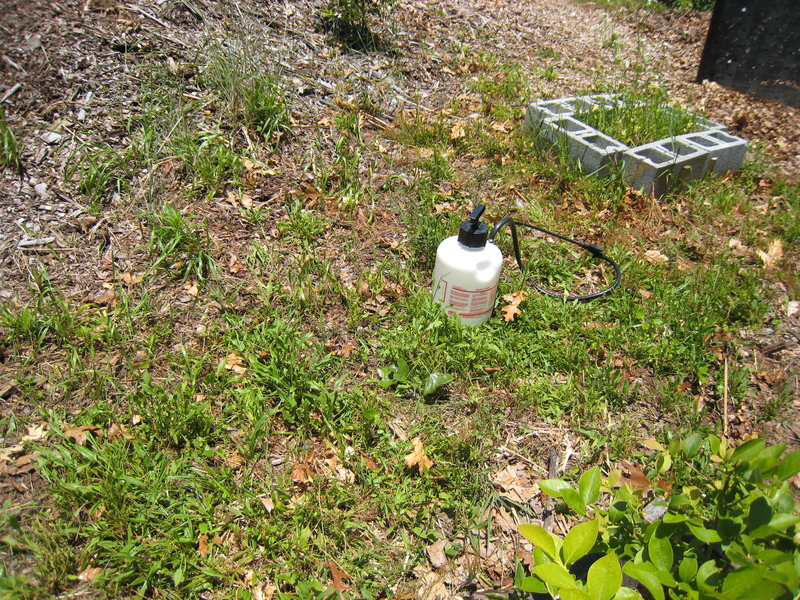 What do you do to combat weeds in your garden if you don’t want to use the toxic chemicals? Please let me know your favorite recipe. Hive Swarm – Part Two. In my previous post, I had related the story about how I had received a truck load of beekeeping equipment and that I was hoping my “Mother Hive” would swarm. Today as I was suiting up to do a few things with the new hives, I heard a really loud buzzing and my attention was drawn to one side of the garage. When I looked, I noticed a huge “tornado” of bees – I knew instantly that my large hive had swarmed. The only thing now was to wait to see if they went into one of the boxes they had been investigating over the past few days. And sure enough, they did. They went right in, they went directly from the main hive to one of the new ones I had set up only days before. 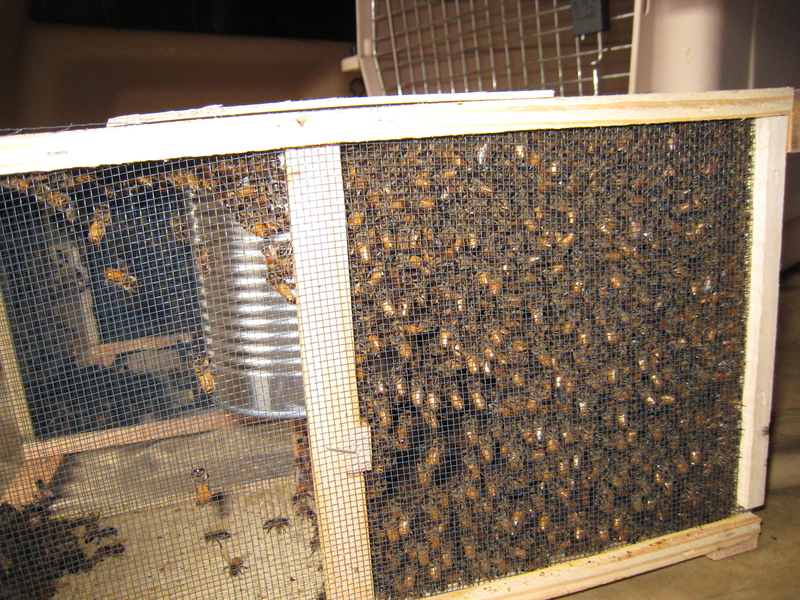 The whole process took a while as the swarm was actually very large, but they went in and got settled. Such a neat experience and I am grateful to have been outside and able to observe the swarm when it occurred.